Suit Up the Coaches! 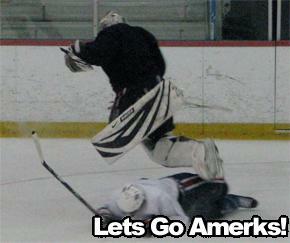 · Let's Go Amerks! 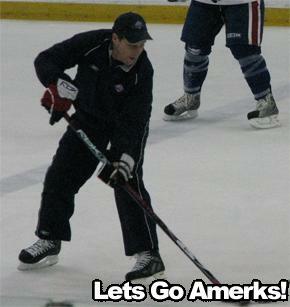 There’s always a lot of talk that this Amerks team needs some veteran leadership on the ice, after watching practice this morning we think current assistant coach Jason Cipolla should suit up and join the team.Â He seems to be in great shape and played as recently as 05/06 in GermanyÂ where heÂ had 7 goals and 10 assists in 50 games.Â Jody Gage, get outÂ a PTO contract and make him sign this weekend! On to the rest of practice.. While they’re at it, they could also suit up goalie coach Bob Janosz to start some games and give us some more experience in the nets.Â Bob was making some great saves at practice to the point one would’ve thought weÂ acquired a new goaltender.Â He was in goal along with Adam Dennis because Tyler Plante is sick and had the day off, hopefully he didn’t catch the same flu that Andrej Sekera had. Ok, maybe those signings would never happen, but it’s a different approach to everything that’s been going on. Kenndal McArdle also had the day off to get some dental work done, he’s hoping to soonÂ shed the jaw protector he’s been wearing after his jaw was broken earlier in the season. Towards the end of practice they played 4 on 4 with the offense playing against the defense, Mike Funk was the star of the show after he scored about 5 goals. Two players we continue to be impressed with as the season goes on are Mike Weber and Franklin MacDonald, both defenseman seem to be giving great effort every minute they’re on the ice and improving daily. Adam Dennis came flying out of the net and made a save to only get sent flying over Mike Weber. Marc-Andre Granani started practice with the defense but switched up early on to join the offense, where he should remain.Â He’s been much better offensively than when assigned to the defense. Many are saying there is absolutelyÂ nothing to be impressed with regarding this season as the Amerks havn’t been winning games or scoring a lot of goals, but players are putting in an effort to keep improving, and it gets boring if every article everywhere is simply about being in last place. The Amerks return to the ice at home on Friday against the Manchester Monarchs.